Baltimore Magazine-Moss Hill House-Feature Article, 2017; Best of HOUZZ - Design + Service 2019, 2018, 2017, 2016 + 2015; Licensed in MD and the district of Columbia; NCARB Certified; Featured in Chesapeake Home Magazine, Style, Chalets & Maisons Bois, and www.dwell.com, . 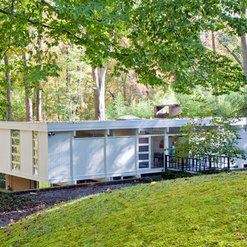 A year and a half ago, my wife and I bought a rather frumpy and dilapidated 1969 house on a wooded hillside bordering Lake Roland Park, in hopes of turning it into a comfy and sleekly modern home in tune with its beautiful surroundings. Laurie Stubb's design helped us do just that. She was a pleasure to work with at every step along the way. From the first meeting onward she had wonderfully creative ideas, yet she was always keenly attuned to our own likes and dislikes, and to what we were hoping to achieve. She assisted greatly in selecting a builder, and in trying to hold down costs down along the way, and she remained closely involved throughout the process, while offering good advice on decisions large and small. 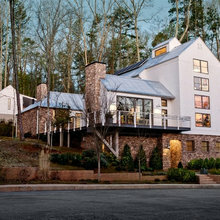 We highly recommend Place Architecture, and are thrilled with how the house turned out. 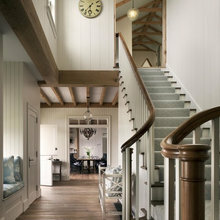 Laurie Stubb was a key partner in my major house renovation, and I highly recommend her. My project included: (1) more than doubling the size of my kitchen by pushing it outside the house footprint, plus adding a cathedral ceiling and a large island with seating, prep sink and cabinets; (2) creating a much larger master bath with a wall of storage and a separate toilet enclosure, a updated hall bath, and a walk-in master bedroom closet, all by gutting the center of the circa 1956 house and pushing the master bath wall out a couple of feet; and (3) more routine work, such as building a deck, powder room and pantry. Throughout the complex process, it helped to have her expertise. For both the design and construction phases, she continually came up with innovative ideas. Even more important, I felt she listened to what I wanted so that there was an effective give-and-take that resulted in a higher quality end-product. 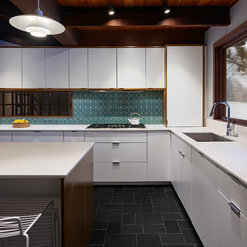 Additionally, she supported me by suggesting various other professionals and vendors (e.g., the structural engineer and the manufacturer of the beautiful, handmade kitchen backsplash tiles). After the design plans were complete, she recommended building contractors and helped with the bid process. Once I had chosen the contractor, she stayed with the project, providing construction and selection advice in a timely manner whenever I needed it. It helped that I found her aesthetic sense excellent, and that she was professional, flexible and also friendly. I am delighted with the final results, and visitors always comment on how beautiful the new rooms are, worthy of a spread in a magazine. I definitely enjoyed working with Laurie. 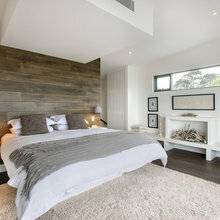 She is a real asset if you are undertaking an extensive home renovation. 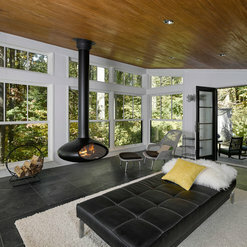 Laurie was recommended by an architect who worked with us on a previous project and who had since retired. We were very fortunate to receive this recommendation, as Laurie turned out to be a great partner for our addition. Our goal was to design a screened porch (along with a bluestone patio) that was more akin to a finished room that happened to have a lot of screens. 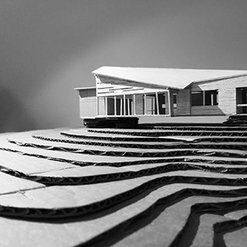 Laurie worked with us through a number of iterations of the plans, and we ended up with a design that fully reflected what we had hoped to achieve. We found Laurie to be a true professional. Her work is top-notch, she was very responsive, and she was a good listener. She was also exceedingly patient, as our questions and specifications were very detailed. The outcome of that good working relationship was a set of plans that were very thorough and that could be executed by our builder (D2 Contractors) with minimal issues or subsequent decisions that needed to be made. We are thrilled with the results and would highly recommend Laurie. Thanks so much Laurie…we are thoroughly enjoying our outside living area! Thank you for your kind words. I truly enjoyed our collaborative team effort to make the project a special place for you. Although, you are missing the hammock in your photo! Laurie is a delight to work with. We have worked together on projects for several years and find her creativity and communication skills to be of the utmost quality. Laurie strives to understand and achieve the vision and dreams of her clients. She always makes herself available when questions arise on the job and works hard to find a solution that meets the vision with the customer and myself in mind. Laurie is mindful of the budget but is willing to make suggestions and hear suggestions that may improve upon design, functionality, and aesthetics. We will continue to recommend Place Architecture to our clients and look forward to working with Laurie for continued success in our joint projects. We can't say enough good things about Laurie Stubb, Place Architecture. We are working with a builder who is customizing a gut rehab row home in Baltimore, including layout for us, and without Laurie, we would be lost. Laurie is very knowledgeable, easy to work with, and has excellent design aesthetic. We had a lot of starts and stops with our project and she was patient and efficient with us along the way. She is very creative and practical about what works with the space and everyday life while keeping in mind the overall design. We worked with Laurie to renovate the kitchen in our 1969 rancher. Working with Laurie was a wonderful experience and we would absolutely work with her again. Before we started the project, we were unsure of how extensive a renovation we wanted. Laurie really helped in the design phase to formulate the best plan to match our wishes and budget. Laurie thought a lot about the details in our kitchen and helped us spec out finishes, especially with our cabinets, to ensure that those design details came through in the finished kitchen. Laurie was always very responsive and helpful over email and we bounced a lot of ideas off her throughout the entire process, from the preliminary design stages, to choosing lighting fixtures and finishes when the project was mostly complete. We are very pleased with the final product and Laurie was instrumental in making the project a success. 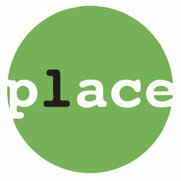 I most highly recommend Laurie Stubb, of Place Architecture. We used her services to help us plan and execute a basement demolition and rebuild in our house built in 1901. From start to finish she provided top notch, quality work. She was prompt in answering our many questions. She did what she said she would do when she said she would do it. She took a lot of time to understand what we wanted for the project. We loved her plans for the basement. The design was beautiful. Her artistic sense is excellent. She came up with creative touches which made the project special. I appreciated her willingness to go to the showroom and help with product selection. She steered us to a contractor who was excellent. The contractors appreciated her good drawings, which because they were thought-through and detailed made the job go smoothly. Everyone who takes a tour of our new basement is very impressed by the quality of the re-model, which directly reflects on the quality of Laurie's work. Thank you Kathryn! 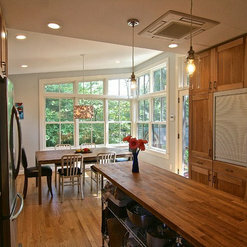 I enjoyed working with both you and Bob on your renovation project. Our collaboration on the design and finishes for the space was crucial for the success of the project. We had a wonderful team! Working with Laurie was like working with family! Her genuine interest in maximizing our living space within our budget was truly appreciated. Laurie's many innovative and current suggestions were a big help. Hire her, you won't be sorry! After a 2 year relationship with Laurie, I can attest to her professionalism, her creativity, her patience, and ultimately to her talent and insight. She was able to have a vision for a renovation that met many unexpected challenges, and she came through with a beautiful ....spectacular ....finished product! And she listens!! It was a long distance project, so communication was key. I highly recommend her professionally as well as a woman of high integrity. She is joy to work with. Thank you Dea Dea! Your project certainly had its ups and downs, as projects sometimes do, but with a great team, your project finished out as we envisioned. We started the project as client /architect and ended it as true friends! 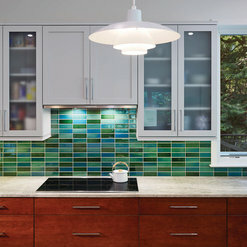 We were first time remodelers with little experience in balancing our 'wants' with price. Laurie is a great listener. We wanted to expand and do a major renovation of the master bath, re-work master bedroom closets, kitchen and family room. When the expansion estimate was too costly for the amount of extra space we would get she thoughtfully cut back so that we still have just about everything we wanted. 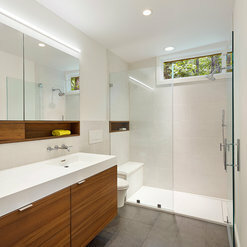 She even found a really creative way to have a full mirror over the double sunk vanity without sacrificing a window. Because the general contractor (Dale German at D2 Contractors who we also highly recommend) said he could start right away, the project did not have final plans - just drawings that were modified on the fly as needed. Laurie had to be very flexible and available to us and Dale. The sheer magnitude of decisions from tile to lighting to outlet and switch placement was overwhelming. Laurie was there for us through it all, helping with even the smallest things such as paint and roof color. When both she and Dale at D2 recommended something we knew it was the right way to go. She also has a great eye for noticing when something was just slightly off. We would definitely work with Laurie again if we had another project and highly recommend her. We had a great team on your project and I really enjoyed working with you both. Our collaboration on all aspects of the design helped make your house a home! Laurie's designs were wonderful! The job turned out beautifully and totally opened up a dark room to one that appeared to double in size with much needed light. We are extremely happy with how our project turned out. Laurie's sense of balance and placement were excellent. We could not have done this without her expertise. Our collaboration on your project was a truly fun process. I am thrilled that you are enjoying the indoor-outdoor experience that was so integral to the design. Laurie was a pleasure to work with on our project. She had a great eye for design and space. She was extremely knowledgeable about product selections. She was great coordinating communication and work flow with our contractor. And most importantly, she was quick to respond to all questions and requests. Laurie was very professional, but also provided a personal touch. Commented: why type of gutters are these?The gutters are 6&quot; black 'K' style. 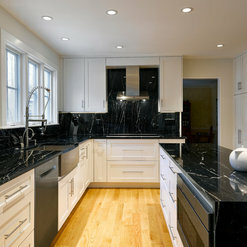 Commented: What is the counter top?The countertop is 'Victoria Falls Quartzite'. Commented: Wall tile is fabulous! !Thank you! Unfortunately, The tile was purchased by our client and I do not have that information. Commented: ToiletIt is a Kohler, White Veil. 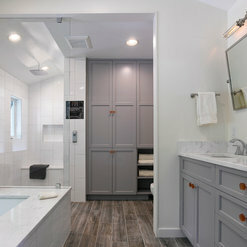 Commented: Love the bathroom..can you share infor on wall tile? Thank youThank you for your interest. Unfortunately, I can not access that information at this time.